Karise Eden’s voice can move a nation. At the age of 19 she was the winner of The Voice Australia and went on to make sales & chart history in 2012 with her debut album featuring uniquely soulful renditions of classic songs. Her voice is powerful and undeniably moving in its raw authenticity, showing that she’s lived a full and complex life despite her relative youth. Growing up on the Central Coast of NSW Australia, Karise began singing blues and rock from an early age. She started playing guitar at thirteen and also picked up the upright double bass. After cutting her teeth at various community festivals around the Central Coast, Karise was prompted by a friend to enter the first series of the Voice Australia in 2012. Her blind audition was the clear standout, blowing away the judges and the live audience before footage of that moment went viral on YouTube with over 7 million views. Karise made ARIA Chart history in June 2012 when she took out the top three spots on the singles chart with #1 ‘Stay With Me Baby’, #2 ‘Hallelujah’ and #3 ‘I Was Your Girl’, with her single ‘You Won’t Let Me’ at #5. Karise is the first person to do this in Australia since The Beatles had the Top 5 to themselves back in 1964! Karise’s album ‘My Journey’ debuted at #1 on the national ARIA chart, was certified double platinum, and went on to become the biggest selling album by an Australian artist in 2012. In New Zealand the album debuted at #3 and was certified gold. 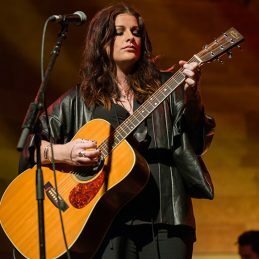 Karise’s influences are wide and varied from blues through to bluegrass and rock and soul: Janis Joplin, Jimi Hendrix, Guns n’ Roses, Doc Watson, Joan Baez, Deep Purple, Etta James, Robert Cray, Joss Stone. Karise might sing a Janis Joplin song in a powerful husky voice followed by a beautiful Joan Baez song the next. She also writes emotionally driven original material that will no doubt infuse future releases. In March 2013 Karise played the main stage of the iconic Blues Festival to a packed out audience. She firmly established herself as one of Australia’s most promising live performers with songs from her debut album plus some recently penned originals that hinted at a new creative direction for Karise. ‘Threads of Silence’ with very little promotional push. Karise just wanted to share a recent song she’d written without doing the usual media circuit associated with major label single releases. Despite the soft release and no mention of it being tied to a new album, the song debuted Top 20 on the ARIA sales chart, highlighting the degree of anticipation for Karise’s next full length release. Karise Eden is one of Australia’s most raw and authentic voices whose live performances are spellbinding. Catch Karise perform a limited number of shows in February 2014 on the INTIMATE SUMMER SERIES.